Learn how reps on small sales teams can use LinkedIn’s Sales Navigator to generate new leads and drive sales in just 30 minutes a day. Growing a Bonsai tree requires a great deal of skill and patience. There are no shortcuts. There are only best practices that, when followed regularly, help the tree become more magnificent with each passing year. Adding essential social selling activities into your daily routine doesn’t need to be daunting. In fact, you can grow your social selling “roots” in as little as 30 minutes a day. Read on to discover how reps on small sales teams can effectively use LinkedIn Sales Navigator in just 30 minutes a day to plant the seeds that eventually lead to increased sales revenue. If you work on a small sales team, you likely do not have access to a vast network of organizational connections. This means you must become good at finding the right people. The “Premium Search with Lead Builder” feature within Sales Navigator can increase your sales prospecting effectiveness. You can quickly find qualified prospects using search filters such as job title, company size, seniority, and location. Once you receive search results, you can view full profiles out to your 3rd degree connections. When no connections exist, you can “unlock” profiles to learn more about specific prospects. Premium Search with Lead Builder can also increase your sales prospecting efficiency. Be sure to save your most effective searches. By saving searches, you can setup notifications when new sales prospects match your existing search criteria. Saving searches and setting up notifications only takes a few minutes, and as a result, you’ll be able to identify highly qualified prospects without any additional work. When a warm prospect path does not exist, as is often the case for reps on small teams, InMail allows you to communicate directly with your prospects. Since carefully crafted InMails tend to be much more effective, investing at least ten minutes per InMail message can be well worth your while. If your prospects aren’t ready to buy, Lead Builder also allows you to save contacts as leads. Doing so allows you to watch for buying signals via status updates and other LinkedIn activity, so you can reach out when the time is right. The first rep to contact a prospect will get the sale 50% of the time, so taking five minutes each day to check status updates is important for staying on top of new developments that require action. Monitoring a bonsai tree daily might seem tedious. How much can it actually change in such a short time? The reality, though, is that a lot can change in a day, both in bonsai growing and in sales. That’s why dedicating time daily to check your LinkedIn feed and Sales Navigator News Stream is essential for keeping your finger on the pulse of your network and saved contacts. Taking around five minutes every day to monitor updates for buying signals will allow you to capitalize on opportunities and strengthen existing relationships. 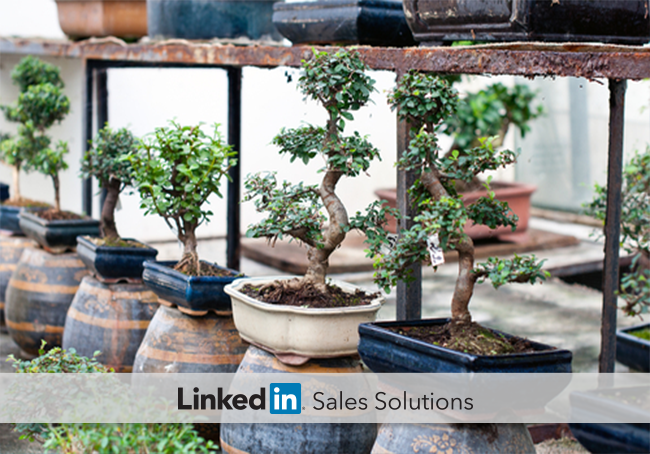 Growing your social selling expertise, just like growing a Bonsai tree, is not something that will take place overnight. With the right amount of time, effort, and patience, your daily incremental efforts will create the strong social selling “roots” that will allow your future selling efforts to flourish.